After all of the conveniences that technology has afforded us sailors, there is still one luxury that has eluded us. Although more popular than ever, a furling mainsail is still not 100% standard equipment on today’s boats. The reason for this is that it has always presented some negatives that leave many people unsure about whether or not to take the big plunge. Let’s explore some mainsail furling options and the pluses and minuses associated with these systems. In-Mast Furlers: Making the strongest run in the OEM market, in-mast furlers, are found on more new production boats than conventional masts these days. In-mast furlers offer the user a relatively short list of benefits. Due to the foot of the sail being a lot shorter than the luff, a vertically furling mainsail has less sail to furl. Also, the boom weight is significantly reduced when compared to that of a conventional or in-boom furling unit. The last part of the in-mast furler’s “list of benefits” is the reduced cost in purchasing/replacing the sail….which is a good thing considering in-mast furling sails require regular replacement for efficient furling. Behind-the-Mast Furlers: Although more uncommon, and typically a custom built, non-OEM afterthought, the behind-the-mast furler is also an option to help overcome your mainsail management woes. With Facnor’s behind the mast furler being the exception, the behind-the-mast furler has the additional advantage of being externally mounted; so there is no little slot to try and squeeze the sail in between. Due to these furlers being essentially a headsail furler mounted on the aft face of the mast, they make life a little easier when it comes to diagnosis, repair, service or even a jam. In the case of the behind the mast furler, you’ll need to talk to your local rigger and ask about what system they might use and how they would go about installing it. Boom Furlers: With that, let’s move on to the in-boom furler benefits list. With an in-boom furler, you have the ability to reduce weight aloft when comparing it to an in-mast or behind-the-mast system. The slot in the top of the boom is usually quite wide, minimizing the chances of a pinched sail as it’s rolled away. In-boom furlers allow for a fully battened mainsail, this promotes a much nicer sail shape with more ‘roach’, and often times even a more powerful sail-plan. Although these sails are more expensive due to the full length battens and heavier material, they offer better performance in regards to power and sail shape. If nothing else, this more robust sail will last much longer when compared to conventional or in-mast furling sails. The last benefit, and perhaps the most important is, the system uses gravity to furl the sail away. So if for some reason the user has issues with the furl, one can always just drop the sail. Cost: None of these systems are considered inexpensive by any means, but whether we are talking new mast construction or existing mast conversion, in-mast units are the most expensive, followed by in-boom furlers. The least expensive, but also the most unsightly option, is the behind-the-mast furler. 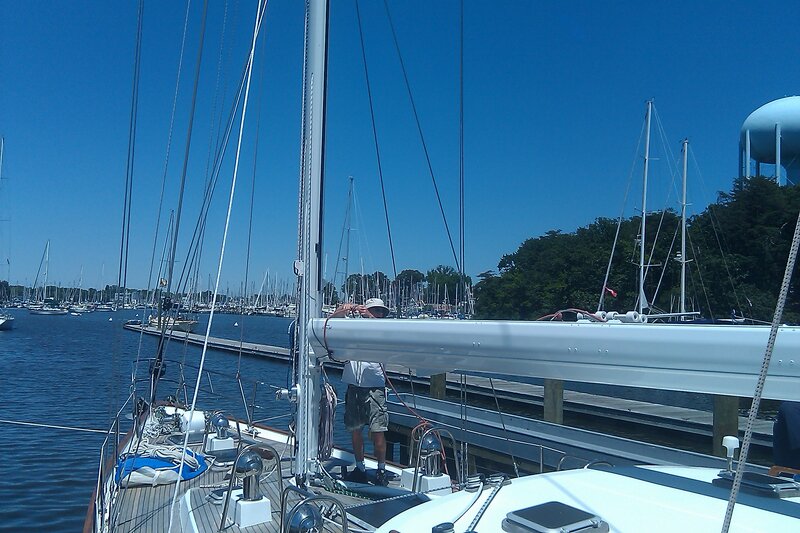 ~Read more here on yet another option to handling that pesky mainsail. So which manufacturers are the best? Well that is a matter of opinion, and in my opinion if you absolutely have to have an in-mast furler choose a Hood system (now branded under the UK spar builder Formula Spars). Based on service experience, newer models of in-mast furling masts are lacking in design, are cheaply made and cause more issues for boat owners than convenience. The runner up however has to be Selden Mast’s in-mast furler. Selden, like the Formula masts, are two of the only in-mast manufacturers that offer a winch handle socket near the drive mechanism so that the system can be overridden manually…a MUST in my book. The Formula and Selden in-mast furlers have luff rods that can be tensioned, this makes for a much stiffer furling axis and therefore a smoother furling experience. Also, these two in-mast manufacturers are the only two current builders (that we’re aware of at least) offering an electric or hydraulic drive which powers the luff rod itself. Lastly, the Formula spar, like the Hood spar that it succeeded, has a sail housing entry slot that is quite a bit bigger than the other in-mast furling spar manufacturers on the market. So, thank you Formula Spars for keeping alive a good product. If you are leaning towards an in-boom furler, I would look at the Scheafer Beta Boom or Leisure Furl system. Why? Well the short answer is both companies have a product that has been ‘tried and trued’. These products achieve safety and functionality through simplicity (our mantra). For more information regarding boom furlers, we have put together a few words on that subject here. FAQ: Can I convert my in-mast furler to an in-boom furler? The short answer is yes, but read more on that here. Have a question or comment, drop us a line below. We will reply! What is the best type of line / rope for the inhaul for an inmost furling system. I need a thinner one than my outhaul to fit the roller. I want a high tech durable line that I never have to change again! “Never have to change again” may be a bit of a tall order, but any new line will surely offer many years of functional life. If it’s an in-mast furling unit with a worm drive type, I would choose a 3/8″ MLX made by Samson Ropes. If it is a continuous furling line that essentially makes a loop (has to be spliced in place) I would recommend MGP Furler 50 in 10mm. The latter wants to be a bit thicker so that it can bite into the driving mechanism better. We offer both, the MLX sells for $2.89 per foot and the MGP sells for $3.72 per foot. Hello, I’m looking at purchasing a Pearson 424 sloop rig with a Hood In Mast Furling system with an electric motor to power the furler. I’m told it was original to the boat circa 1981. Is this possible? Secondly, the motor is broken and has been replaced several times. It seems to last only a couple of years. Is it possible to easily refit it with a manual screw or whatever one calls it with a furling line? Would one have to drop the mast and essentially refit all the furling bits? Any info would be appreciated. Yes, I think it is very likely that this is original. I would re-build the motor and the entire furler system at the same time. We would have the mast taken down for this. I know it sounds counter intuitive but the electric drive unit’s are superior to the line drive ones in our opinion, it has a manual override feature which is a big plus in our book. Just as all things in sailing maintaining and keeping things in next to new running condition is vital. I would keep it as is, just refurbish what’s there. I have a Hood Stow-way in-mast furling system that has started binding. I just completed a circumnavigation with it, but I was concerned that it was only a matter of time before I’m unable to set or furl the main. Assuming you’re familiar with this system, is number I can call to discuss? Absolutely call anytime Monday – Friday 9-6 Eastern standard time. 443-847-1004. We’d be glad to help. I am looking to buy a CT 54. I am 60 and will be sailing shorthand most of the time and want to be able to handle the boat safely from the cockpit. This boat already has roller furling head sails. I am looking at installing the Facnor mainsail furling system on the main and mizzen sails. What are concerns and issues with the Facnor system that I need to consider, and would you recommend the Facnor system. Thanks for waiting so patiently for a reply. I have met almost the same amount of cruisers who love the Facnor behind-the-mast system and those who don’t like it. I am always a big proponent of boom furlers over in mast or behind-the-mast. The reasons as stated in the article, is that there is a manual override option and also the sail can just be lowered conventionally even if that doesn’t work. I would say that I may even look to a good Lazy Jack and Tides Track system that hoists and douses the sail conventionally, via an electric cabin halyard winch. Any of those in my opinion are better options over vertically furling sails. I hope that helps and thanks for the read. 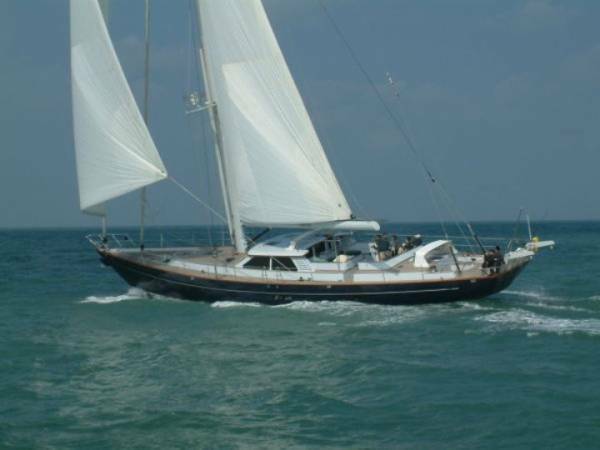 I am considering the purchase of a 1981 Gulfstar Sailmaster 47 with electric in-mast furling. I can not find any information on the mast as to the manufacture. Is it possible this is original to the boat? can it be converted to Manual? Thanks for asking the first name that comes to mind is Hood (now <a href=”http://formulamasts.co.uk/”>Formula Spars</a>). If you send a picture of it to our email, theiggingco@hotmail.com, we can get a better look. With that, I would say that if it is electric you can likely convert it to manual, but I would just service the electric component and make sure it is up to snuff. The electric drive in-mast furlers work better than the line drive, IMO. Also, they are one of the few in-mast furler manufacturers with a manual override…a great feature. Last note, when I hear GulfStar, I think chainplates. Make sure they’ve been dealt with or budget to replace them. I own a 1990 Moody Eciplse 33 with a manufacturer supplied inmast main roller. I believe it is Kempston (now selden?). On my system the out haul rope goes into the mast onto a drum but it often jams due to overrides etc. I have seen a gadget on other boats where the inhaul/out haul line is a continuous loop of rope round a winch fitted behind the mast which turns by a screw mechanism the inside tube that the mainsail wraps round. Is there a way of having such a winch retrofitted to my existing system or do I need a complete new system? It’s doubtful that you can just make this upgrade without a whole lot of fuss. Can you send me a picture of what you have to jimmie@theriggingco.com.There may be some other solutions available to you. Please find attached photo of our mainsail furling mechanism, as requested. Not sure that works on here. Try emailing them to jimmie@theriggingco.com. Is it feasible to convert a staysail furler to a behind the mast mainsail furler on an Island Packet 31? It depends on the furler manufacturer. Likely you will need to add extrusions. So the furler will still need to be in production or readily have parts available. Then there will need to be custom attachments made; for the mast head and at the boom. The mast will need to come down for this type of work. I am having major jamming issues with my in mast furling main (2009 36′ Hunter, Selden Mast) have come to the conclusion that a new sail is needed. Any recommendations as to which sailmaker to go to? OEM is Doyle. Thanks for asking us! I would give <a href=”http://www.chesapeake-sailmakers.com/”>Chuck O’malley at Chesapeake Sailmakers</a> a call. He used to be Chesapeake Doyle many years ago, but has since quit them and started his own outfit. As a second option, try <a href=”https://www.quantumsails.com/lofts/quantum-annapolis”>Jason Currie at Quantum Sails Annapolis</a>. Both are very good sailmakers. I would give both a call and see who gives you the best feeling. Is it possible to replace/repair the in mast furling foil without unstepping the mast? I am looking at a 2003 Jeanneau 54ds. It very likely that the answer is no. Find out who the spar manufacturer is and give them a call on this. Look for a manufacturers badge on the spar. Thanks for your reply. Just to update you. The spar manufacturer was Z-Spar. They have made many of the masts and rigging supplied to Jeanneau. The foil, as you suggest, is typically installed when the mast is un-stepped. After speaking with the factory, however, we discovered that their way of dealing with my issue is to remove the furling gear at the bottom of the mast, lower the foil, cutting it into removable 2 metre lengths as it is lowered. We noted that the 22m foil already had 9 riveted joints in it from when it left the Jeanneau factory and was not made from a single length of foil profile. Z-Spar shipped a, correctly sized, new foil, in sections, along with the appropriate rivets for about 800eur. Removing the old foil and replacing the new took about 3 hours in total. We also took the opportunity of replacing the rest of the furling gear for about a further 700eur. Nice work John and thanks for the update! I regularly sail on a 48 foot yacht (Contest) which has Whitlock In-boom Furling, which most of the time works well. There is a problem, though, that the sail will occasionally jam (in the boom) after being rolled away, following a period of sailing reefed down. The jam is caused by the sail “riding up” on the mandrel, towards the mast. The concentration of wrinkled sail, towards the mast end of the boom, causes a jam when the sail is next deployed. Is this a common experience? And, if so, is there an easy solution? Hi Stewart! Thanks for taking the time here. Try this… I would adjust the boom’s topping lift and the rigid vang to fix how the sail stacks/ rolls. If the luff stack is walking forward on the mandrel the boom needs to be lowered at the outboard end. It’s the reverse if the sail’s luff is walking aft as it rolls onto the mandrel; the O.B. end of the boom needs to go up. I have to say I am unfamiliar with a Whitlock In-boom furling system. Either way, it should have a hard vang, no? If so, and the vang is a fixed/non-adjustable vang, then try suspending the boom from the topping lift, remove the vang, and adjust the topping lift, while furling the sail down, until the desired furl stack is achieved using the methods above. Then adjust the vang to fit this boom setting (HEADS UP! you may need to move the boom and mast vang brackets/lugs (i.e.-attachment hardware). If there is no boom topping lift or spare main halyard (we are firm believers that there should always be a topping lift) you will need to figure out how to adjust the vang to move the boom up or down for the same result. Hi, Thanks for that. We will give it a try. Stewart H Kinsman. Hood were taken over by Formula Masts at: http://formulamasts.co.uk/ who now make an improved version of the Hood product. A good company. In-mast furling works off the wind. How about in-boom? Do you need to come into wind to reef? Definetley a good question, I should have addressed this in the write up. The problem was not so much in reducing sail but in the hoist. Older systems have had issues with this, especially the systems with a solidly mounted track instead of hinged one. The problem was that the sail would fill prematurely and it would try and push it out of the track some times and cause the luff to bind. Newer systems have resolved this issue with hinged tracks (Schaefer) and as for the fixed track systems, by adding a flexible lower portion of the track (Leisure Furl). As a general rule of thumb you should always luff the sail slightly for hoisting or reefing.